There is more to Lent than giving up sweets and having soup on Friday Religious Customs in the Family shows how to make Lent truly fruitful. This ceremony is a symbol of penance and sorrow for our sins. In the early Christian centuries, it was only used for public sinners, but around the year 1000 the popes and all the faithful started to receive the ashes as a sincere and external token that we all are poor sinners. These things might he explained to the children, so they will benefit from the understanding of the sacramental which they receive on Ash Wednesday. It should he a powerful reminder for them that they must start a time of special penance and cleansing of their hearts through prayer, contrition and self-denial. On Ash Wednesday a family devotion might be held which expresses the spirit of the season. Also. some external sign of Lent might suitably be arranged in the home, like removing all flowers from the family shrine, or replacing the statue of Christ by a crucifix or some other such gesture of symbolic significance. 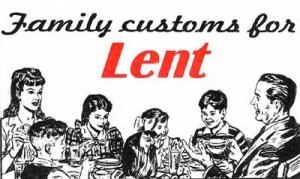 The grown members of the family who are obliged to fast should on occasion explain the law of Lenten fasting and its practice to the children, so they will understand its purpose and meaning. Also, the term “penance” should be made clear to them. It does not wean sacrifice and self-denial in the first place, but a “change of heart,” a victory over sin and a striving for holiness. The sacrifices of fasting and self-denial are only means and signs of this spiritual penance. If children understand this well, they will not put the main effort in Lent on technical feats of abstaining from pleasures which sometimes make them proud or vain), but in sincere contrition, prayer and humble fight against their faults. Only on this basis, and with this motivation, should they be encouraged to practise some little acts of sell-denial like abstaining from certain delicacies (candy, chocolate) or pleasures (movies. comics. etc.). It would seem a wholesome suggestion to make the children aware that it is a much better penance to do what is necessary than to abstain from what is not necessary. “Obedience is better than sacrifices.” (I Kgs. I5:22). What good are external acts of penance if a child, while abstaining from candy, stubbornly fights every day against Mother’s order to do the dishes or to perform some other chores, and if he neglects his schoolwork or constantly harasses brothers and sisters with his unfriendly behaviour? A traditional means of reminding the fancily that it is the holy season of Lent is the Lenten foods, which are served only at this time of the year. Thus, parents and children realize, even at their meals, that prayer and penance should be practised during these days. Apart from meats, anything might do as “Lenten food,” so long as it is not usually prepared in the same way during the rest of the year. In some countries it was customary to bake the buns with an indentation in the form of a cross (cross buns). In other places, certain soups are served only in Lent (bread soup, lentil soup, spinach soup, etc.). In many families, the desserts are made without sugar frosting or whipped cream during Lent. [Or dessert may be entirely omitted from meals.] There are many ways of indicating the holy season by the choice of certain Lenten foods. Any one of them is good, as long as it is reasonable in itself and serves the purpose of reminding the family of Lent. That many people eat pretzels today all through the year, that they take there together with beer in taverns and restaurants, is only an accidental habit. The true purpose and meaning has been forgotten. However, the pretzel still is an image of arms crossed in prayer: it still is the symbol of prayerful penance in Lent. In many places of Europe pretzels are served only from Ash Wednesday to Easter, thus keeping the ancient symbolism alive. There seems to be no reason why our Catholic families should not return to this beautiful custom of our ancient Roman fellow-Christians, especially since we still have these breads around everywhere. The children will be delighted and greatly impressed when they hear the true story of the pretzel. And such a pretzel at their dinner plate ever)- day during Lent will certainly proclaim its spiritual message as clearly and deeply to them as it did to many a Christian in ancient Rome.